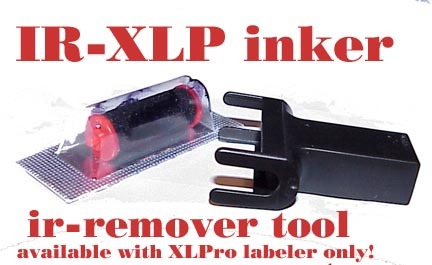 Use the roller remover that arrived with your labeler to remove & replace the ink roller. Please view the instructions for loading the ink roller by clicking the ink roller in the middle of the header on every page of this e-shop. Dispose of spent roller ASAP. It tends to be messy. Always keep your image sharp with a fresh ink roller. Never use any other product on the inker or labeler. Using other ink will terminate your warranty on the labeler. Some inks will cause your labeler to malfunction. Fits all TXM & XLpro 1 & 2 line labelers.